Hello everyone, thanks so much for having a place for all us computer novices to come and beg for help. That being said, beg is exactly what I intende to do. Heh.. I wasnt sure if I was supposed to start a new thread or reply to this one, since it's the same topic, so I just added to this one. I'm sorry if I should have done something else. I'm working on borrowed time here before my computer BSoDs on me again. Like most people here I've been trying every which way I can think of (or come across online) to try and fix the issue on my own, and I'm really at a loss. I've gotten a plethora of different messages in the stop errors, some of which are (IRQL_NOT_LESS_OR_EQUAL, PAGE_FAULT_IN_NONPAGED_AREA, file Nv4_disp infinite loop, and system32/drivers/ntsf.sys just as a few) Now keep in mind this laptop has been send back to HP twice before due to the beeps of death (lots of death) One long adn two short beeps, which I was told is a video issue of some kind.. I thought perhaps it was a driver issue, and I looked and searched for updates to my drives-- I couldn't find any really. I'm not sure if that is because there weren't any to be found, or I don't know where to find them. If I look at my device tab there are no yellow exclamation points or red Xs to be seen, it says everything is working properly. So I thought perhaps I should simply reinstall the OS back to factory with the disks provided, which I managed to do after a great deal of frustration. I thought everything was fine for a little while, and then bam, more blue screen. So I thought maybe it was a ram issue, and I pulled out one stick then another, when I pulled out one stick it seemed to fix the issue-- I had no more blue screen for almost two days. I went out and bought a new ram stick, and a laptop cooling pad just to be safe. And the blue screens are back. I'm truly at a loss, I've considered it being a video adaptor issue, though I have NO idea how to deal with that. I'm about to chalk it up to one of those things, getting hosed and moving on. But really, it's become an issue of I want to know what the issue is so I know. Also I know sUBtech asked to add the mini dump file here but I can't seem to find it. I've disabled autoshutdown after an error, but there isnt a file named that in my computer anywhere, so who knows where that is. In the end, any thoughts anyone has on this would be helpful, as I'm all out. I have been getting the BSOD since a new install and the Memory_management error. i have know idea what is causing this so can you please help as it is very frustrating. it will sit running for ages and then go to this screen. i will close outlook and start again and get it again. then i could open a web page and then get it ther is no real consistancy as to what is causing it. Edited by Elwood62, 20 April 2009 - 12:20 AM. Someone else mentioned having this problem earlier in this thread. It's a BSOD that says REGISTRY-ERROR and the STOP: 0x00000000051(0x003, 0x001) and so on. We have windows xp repair disks, I believe. How can we recover the operating system? Then check to see if there are any yellow question marks or red "X's" next to any of your devices. If there are then you can right click on the device with the mark and click properties. This will then give you a brief explination of whats wrong with the device, if the driver is missing then you can select to upgrade or install it. Can also be caused by incorrect BIOS settings, just reset your BIOS settings in that case. Here's How To Fix Blue Screen Errors Easily. I was having the same problems, a lot of freezes and system crashes. I had recently installed a additional drive in my notebook SATA, and I thought that was the conflict so I removed it. I had also bought OEM software and thought that may be the problem so I got a Full Retail OS and still the same thing. I kept getting messages to check newly installed hardware etc., IRQL Not Equal and to run Scandisk..... I tried everything to no avail, and then it hit me.....BAM! the memory that came with my machine. My machine rebooted with no errors and works flawlessly even with the OEM version software, and I had to find out the solution when i spent 100.00 more on full retail. Get that Generic Memory the [bleep] out of there. Not all Generic Memory causes this problem, but if you have Bluescreen errors, you have purchased the kind that does. I als did a wipedrive with WipeDrive software for a 100% clean install. For 6 month, in some period I have blue screen with this code( stop: 0x0000000A(0x000000C4,0x0000001C,0x00000000,0x8050304d)on my laptop(Dell latitude D630)and then when I turn it on and off I hang up at bios check and then for third and fourth I have blue screen at the windows startup and now there is no problem and every problem be disappear,and when I run dell diagnostic program, it cannot find any problem. also I haven't installed no hardware and software. Edited by misagh1, 12 August 2009 - 02:25 PM. Now I can't boot into any modes or reinstall Windows XP pro - every method goes to this BSoD or repeats restart. I was trying to install Adobe CS3 when the screen froze so I pressed restart. Hi there everyone, I am sUBtech and i would like to express my desire to help on BSOD issue. I have a little knowledge on how to debug BSOD and advice on errors that causes BSOD. Hopefully, admin and moderators allow me to extend my services here to help everyone that is having troubles. 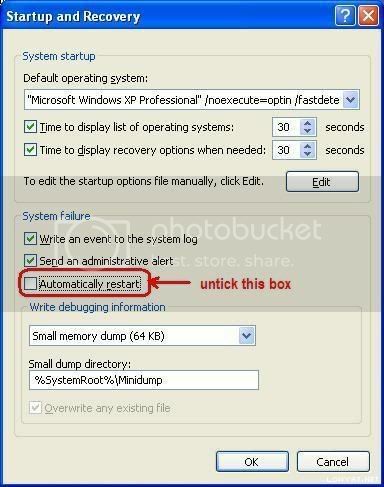 Below are my guide and tutorial for those who are having problems with BSOD. Please follow accordingly so that i can assist you on your issue. Go to My Computer and locate C:\Windows\Minidump or C:\Minidump. Once you have the minidump folder, please zipped the whole folder and upload it here (using add attachement function) or other web hosting page mentioned below. Please provide the link to download your file. HI, here is my zipped minidump file. Please let me know what is going on. Thanks I just found out that my upload failed cause its 563k...how else can i upload this file to you? Possibly an email to you? Hi, i've been having the same problem with my pc, it blue screens whenever i switch it on, anyone have any suggestions about what i should do? Should i re-install windows? Any advice would be appreciated, Thanks. Edited by wannabe1, 29 June 2010 - 04:50 PM. all this and some others..
-- corrupted hdd?? -- bec of the ntfs.. ?? Please help me someone! Thank You! ...and then it hit me.....BAM! memory, but the upgrade was with -----> GENERIC MEMORY", so i removed it and replaced it with the original memory and VOILA! no more Blue Screen Errors', it is that simple. I bought my PC (from Currys) in Dec2006. Quite soon it started to exhibit the BSOD. I removed the supplied graphics card and ran the PC with the onboard (motherboard) graphics. No problem, except that uses upto 256MB of the 1GB system RAM. In Dec2007 I upgraded the 2x512MB Dimms with 2x1024MB Dimms (Generic). Strange, it passes memory check utils, is only problem in Windows (not Safe mode). Future task is to try the "faulty" graphics and memory with a HDD installed with Linux and see if crashes occur. There are no adjustable BIOS settings for memory - all automatic. I'm assuming the problem is the motherboard, rejecting these two expansions, therefore itself probably faulty. But it continues to run for days without issue with the 1GB and onboard graphics. i cannot get past the blue screen ?? ok i need some serious help,i have an ancient dell dimension 2400 which i want 2 fix so i can use again. by the way it runs on windows xp. i'm having problems with the "blue screen of death" but my error code isnt mentioned in the upper pages. the message is 0xc0000142 if anyone could please help me with this i would be very thankful. on another note i dont care if all the memory gets erased its all useless stuff from a long time ago.